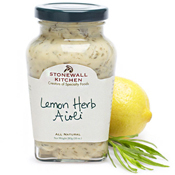 Fire up your taste buds with this robust aioli from Stonewall Kitchen. The combination of sun-ripened chilis and garlic will add a flavorful kick to your sandwiches, burgers or chicken, and makes a great dipping sauce as well! Stonewall Kitchen was founded in 1991 by Jonathan King and Jim Stott, two former waiters who spent their weekends selling their own homemade jams and jellies from a card table at local Maine farmer's markets. From the beginning, the company was based on ideals born out of Maine: unspoiled beauty, wholesomeness, and a sense of community. It is a testament to the art of preserve making and the public's growing interest in wholesome, quality and tasty ingredients. What was once a weekend hobby has grown into a multi-million dollar specialty food business – one of the most awarded in the industry. 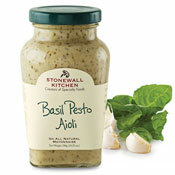 Stonewall Kitchen's commitment to quality – and to their customer – is evident in every product. In business for over 20 years, they know what makes specialty food special. The Savory Pantry has done business with Stonewall Kitchen since our beginnings in 1998. Since then, we have grown together. 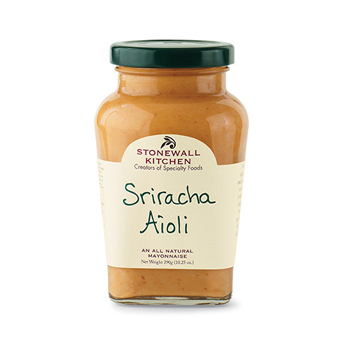 The Savory Pantry is the largest retailer of Stonewall Kitchen products in the state of Arkansas, and, as an independent specialty food retailer, we are in the top 5 retailers for Stonewall Kitchen products in the mid-west. The reason? Stonewall Kitchen gives us quality products our customers love, and ask for repeatedly. It's that simple.